but we think about them anyway. or just chasing after some finer day. I’ve never managed to grow a watermelon before, but right now there are maybe a half dozen moon-and-stars melons out there in the garden. I’m out there checking on them, first weekly and now daily, like little unborn babies growing bigger and rounder and nearer to their due date. Tell me, Internet, how do I tell when these things are ripe? The one in this picture is bigger than a basketball. They all sound alike when I thump them. Should the vine start to dry up? I don’t want to miss out on sticky, juicy, melony goodness. In fact I want to have a watermelon party and invite some friends and family over to partake. I’m no prophet, I don’t know nature’s ways. With apologies to Carly Simon. I have four in my garden and have the same problem…I have no clue when to pick them! This was my first time with a garden and it’s been a learning experience. Here’s a couple ideas that I’ve heard about and used with some success. First, the thump should sound more like a thump on your chest, rather than a thump on your forehead (not ripe) or a thump on your belly (too ripe). You don’t want it to be too hard or too mushy. Also, the bottom of the melon should have a large yellow spot. These will guide you, but use them to pick the first melon and then taste it. If it’s not ripe and they all are about the same size, wait a few days and try again. 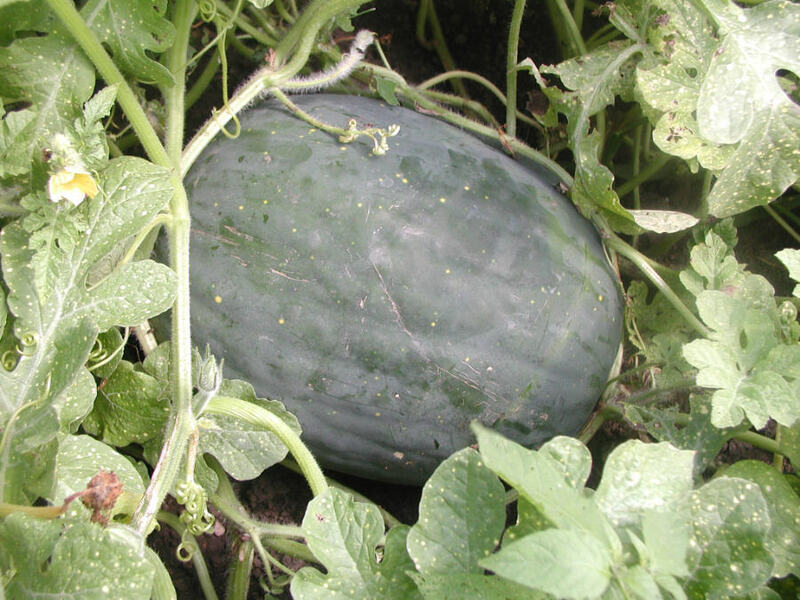 With the varieties I’ve planted, I’ve found you’ve got about a 10-14 day period when the melons will still taste very good, so be patient. As a side note, I’ve planted the watermelons with the orange-yellow flesh. I’m pretty sure they aren’t heirloom, but they sure have a great, unique taste. Good Luck! Thanks for the ideas, jonesranch! When all else fails, ask Grandma. My 91-year-old grandma said that there are little tendrils opposite of the vine that the melon is attached to. When those dry up, the melon is ready. Looks like ours is ready! It will make a nice treat for the upcoming holiday weekend.Hope this helps you, too, Marsha!